Most people in the diamond trade and especially the big names, are aware that DeBeers has implemented a blockchain. Interestingly, a very small percentage of these people really understand what a blockchain means. Talk about the GLIZKOIN diamond blockchain and you might hear that, DeBeers is doing the same thing. In reality, there is a big difference in the approach of these two blockchains. Once you understand these two concepts, you will agree that GLITZKOIN goes a step further than, DeBeers in the context of implementing this latest technology. The idea of blockchains evolved from the concept of massive databases. The general concept of a big database is a big server, where validated records are stored. In the case of a blockchain, there are numerous computers (servers) referred to as node. The information stored on one node is duplicated on every other node. From a technical view point, hacking a single server is not a very big challenge but, things are different with a blockchain. An intruder who wishes to hack a blockchain will need access to every single node. There is a lot of truth in the statement that, blockchains are very secure and near hack-proof. The DeBeers blockchain, will store complete information for all diamonds that are registered in the blockchain. The hope is that, such a process will help eliminate conflct diamonds and provide a transparent history of each stone. This activity is something that, remains true of the GLITZKOIN blockchain too. The difference is that, the Debeers blockchain stops right here, whereas GLITZKOIN focuses on utility and goes beyond this stage. 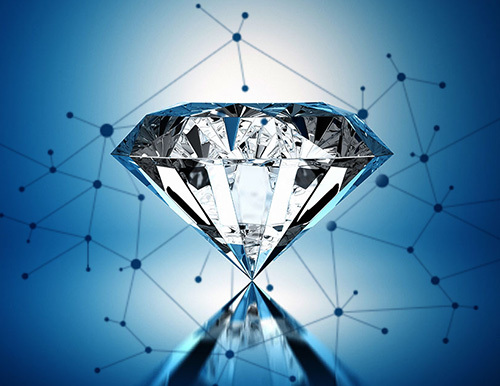 Our project plan includes a blockchain where complete information related to certified diamonds would be listed. Diamond sellers at all levels could upload their diamond information on to the GLITZKOIN blockchain. The platform has a trading feature which means that, anyone could buy any of the listed diamonds. The buyer could be a regular diamond trader or even a novice. Buying and selling diamonds might sound like a routine activity but, the real magnitude of this facility needs to be understood. In the normal trading process a diamond, moves from its original sellers into a long supply chain structure. A number of brokers pass on the diamond, each one adds a small (or significant) profit margin to the price quoted to the subsequent broker. The final buyer, receives the diamond at a price that is loaded with multiple layers of profit. The original seller never really knows who the final buyer is, he is also not aware of the final selling price to the buyer. Similarly, the final buyer never really knows who the first seller was and the first price quoted at the start. In the case of the GLITZKOIN blockchain diamond trading platform, the buyer and seller ‘interact’ directly with each other. Interestingly there is no personal interaction, decisions are made based on the factual data recorded on the blockchain for each diamond. There are no middlemen in the transaction, the buyer gets good value for money paid. At the time of publishing this report, DeBeers has clearly mentioned that, it does not have any plans to implement a crypto currency. In conventional diamond trade, payment is made through banks, currency conversions are required in a significant number of transactions. Bank fees and currency conversion charges are involved, these pile up as overheads to conduct the transaction. By its very nature, a crypto currency does not follow a bank route and paying or receiving this currency, does not require any type of currency conversions to be done. GLITZKOIN implements its crypto currency and this, feature will work to expand diamond markets across the globe. This report clearly explains the difference between the DeBeers diamond blockchain and the blockchain being set up for the diamond industry by GLITZKOIN. Our project is geared towards improving diamond trade in an environment, that would be global, transparent and secure.